It is possible, for the artists interested in the Contest, to take part in a survey of the Spazio in Casso and of the crowning of the Vajont Dam. - September/october: on sundays visits from 10 am to 5 pm, starting every half hour (duration: 40 minutes). On 12 june 2014 the International Artistic Contest Two Calls for Vajont has been presented during the press conference held by dolomiti contemporanee to launch the DC 2014 season. The press conference, open to the public, has taken place on 12 june at 11.30 am at the new venue of casso. 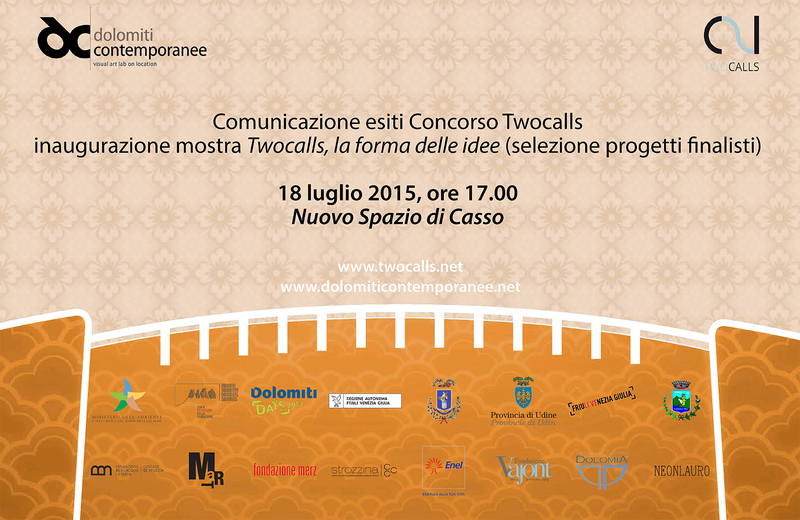 The three main operative partners of twocalls are Enel, Acqua Dolomia and Neonlauro. The power company Enel is the owner of the Vajont Dam: its fundamental support has allowed to actualize the vision of a call for a line, thus activating the central construction site of twocalls.